Audrey Brown chairs a debate from Dar es Salaam, on World War One Tanzania (then part of German East Africa), and its catastrophic effect on the population. 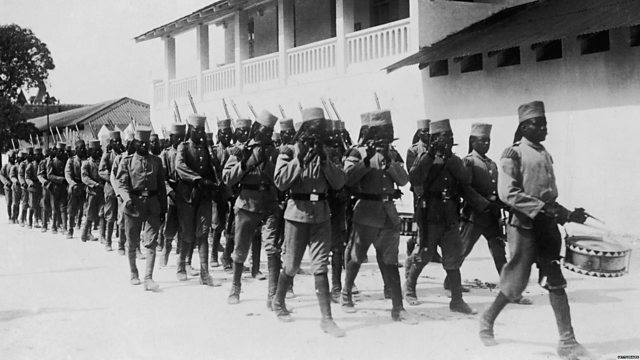 More than one million people died in East Africa during WW1, as the British and German Empires battled each other away from the muddy fields of Europe. The war is all but forgotten in Tanzania, from where Audrey Brown chairs a debate in partnership with the British Council. We hear from historians Bill Nasson of Stellenbosch University in South Africa, Santanu Das from Kings College London, and Tanzanians with family memories, like Oswald Masebo from Dar es Salaam University. From the first shot onwards - track the legacy of the world's first truly global war. Crucial questions answered on every aspect of the war.